Group charters are just one service of Indian Trails. Another is intercity transportation via daily, scheduled routes throughout Michigan and beyond. A third is the operation of special transit systems on contract with large organizations such as Western Michigan University. 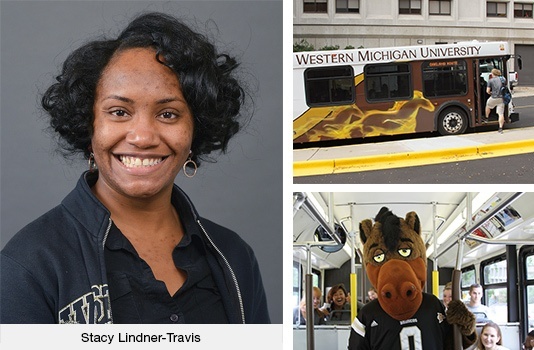 We’ve been providing the buses and drivers for WMU’s Bronco Transit service since 2007. Bronco Transit provides bus transportation on weekdays. Its “Brown” route circulates counter-clockwise through the main West Campus, while a “Gold” route runs clockwise. The cost is covered by student fees. Faculty and staff members ride, too. The university’s bus service also ferries students and staff to the East Campus on an “Oakland” route, to the outlying Parkview Campus, and to the College of Aviation campus near W.K. Kellogg Regional Airport. In addition, it carries passengers between various campus locations and WMU home sporting events. For example, the buses are already equipped with technology that lets students use smartphones and similar devices to find schedules and track their buses on a map in real time. In the works is onboard technology that would announce each stop in ways to better assist riders who are visually or hearing-impaired. A more unusual example occurred last year as part of homecoming activities. The WMU Alumni Association had organized an attempt to break the Guinness World Record for the most couples renewing their wedding vows at one time. So, Indian Trails helped shuttle 1,201 married couples to the site of the romantic event, which did indeed break the old record of 1,087 couples set by Miami University of Ohio in 2009. One of the least-known advantages of traveling with Indian Trails is our round-the-clock readiness to deal with whatever “bumps in the road” life throws at us. 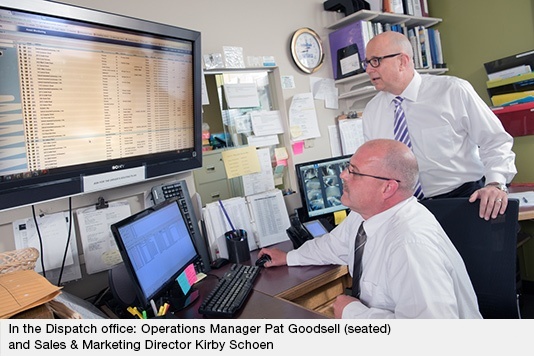 Come what may, Operations Manager Pat Goodsell and the four full-time pros in his Dispatch office have got it covered. They track the whereabouts of some 80 buses and 120 drivers at a time—across Michigan and throughout the U.S. and Canada—24 hours a day, 365 days a year. 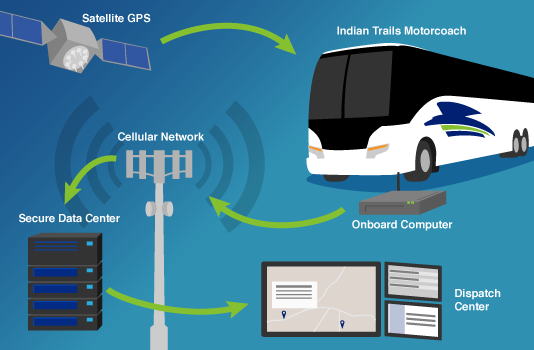 • Satellite-based GPS systems in outer space pinpoint the location of every Indian Trails bus on the road, and send the information to a computer on each bus every 30 to 60 seconds. • Those onboard computers—coupled with Electronic Logging Devices—not only collect the GPS data, but monitor the speed of each bus, any idling or hard braking events, and various engine performance metrics. They continuously transmit this information through the cellular network to a secure data center. • At the data center, the GPS coordinates of each bus are displayed on Google Maps, along with who’s driving, what run or charter number they’re operating, and whether or not they’re on schedule, as well as any engine diagnostic data that indicates something could possibly be amiss. There’s also a map overlay that shows accidents and traffic backups in real-time. • All of this is sent via the internet to computer screens at the Indian Trails Dispatch center in Owosso, which coordinates the responses of maintenance facilities there, as well as in Kalamazoo and Romulus. Dispatch works closely with Charter Sales, putting itineraries together, planning for overnight hotel stays, meals, parking fees and tolls, and arranging for relief drivers on trips that exceed the federal 10-hour, per day driving limit. When you board an Indian Trails motorcoach, you can rest assured that the driver is one of the most well-trained in the transportation industry. We take our drivers’ training personally and seriously. So much so that the U.S. Department of Transportation ranks Indian Trails, including Michigan Flyer-AirRide, among the top 5 percent of companies nationwide for safe driving. Since 1989, we’ve honored 27 of our drivers with a “Million Mile Award” for safely transporting their passengers more than 1 million miles without an avoidable accident. Two more are on track to receive that elite recognition this year. For perspective, a million miles equates to 40 trips around the Earth, or two trips to the Moon and back—but at the wheel of a 45-foot motorcoach, often in heavy traffic or bad weather. Many of these drivers have also served as instructors for new drivers, teaching best practices in defensive driving and maneuvering a $575,000 motorcoach. Even experienced drivers who come to us from other transportation companies join new drivers in our mandatory, five-week intensive training program. They’re instructed not only in the safe operation of motorcoaches, but how to troubleshoot, handle emergencies, obey transportation regulations, stay rested, and provide exceptional service for passengers. Along the way, they become familiar with our company’s historical commitment to great customer service, as well as every aspect of motorcoaches, such as instrumentation and onboard technology, using mirrors properly, operating the air brake system, negotiating turns and merging into traffic, avoiding accidents, proper boarding and de-boarding procedures, and conducting pre- and post-trip inspections. They also learn to follow the unanimous advice of our million-mile safe drivers: The very best way to steer clear of traffic accidents is to stay alert, keep a safe distance from the vehicles of other drivers, and expect the unexpected. 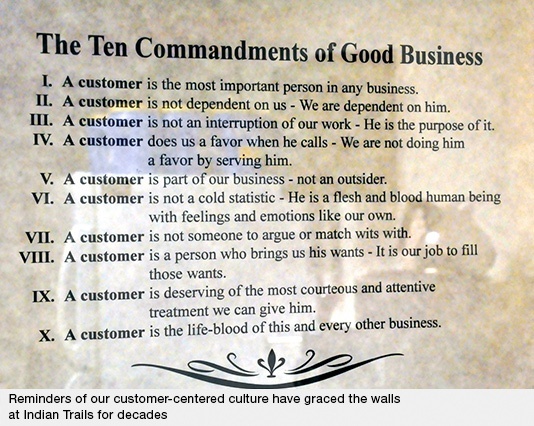 That aptly describes how the employees of Indian Trails collaborate every day to deliver great service to our customers and passengers. We employ more than 180 associates, including charter sales consultants, drivers, dispatchers, mechanics, washers and cleaners, information technology experts, ticket agents, customer service representatives, switchboard operators, managers, and more. Each plays an important role in how effectively we deliver our services. For example, transporting more than 1.5 million passengers a year means we have to answer a LOT of questions efficiently. How does this get done? Another example is our Dispatch office, which handles 100-200 calls each day. A related article in this edition of Indian Trails Express describes how our dispatchers use advanced digital and satellite technology to monitor and coordinate problem-solving for service issues, driving assignments, mechanical problems, and emergencies statewide and beyond. Because our Dispatch center operates 24/7/365—unlike those of some other companies—most problems can be solved in short order. 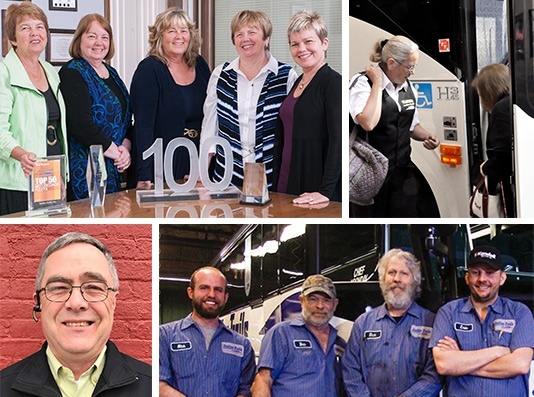 We also have full-time staff who clean and wash each bus every day; mechanics in Owosso, Romulus and Kalamazoo who go through every vehicle to make sure they’re road-worthy; and drivers personally inspect the coach before they take the wheel. At Indian Trails, we wouldn’t be celebrating 107 years of service without our wonderful customers. 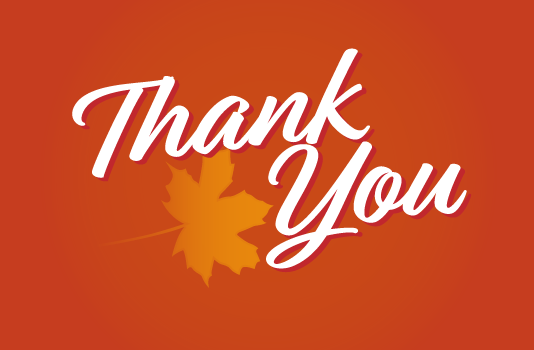 Your support, referrals, and suggestions have helped us grow and improve service year after year, and we are deeply appreciative. From all of us to all of you, Happy Thanksgiving!